The Ambassadors are a prestigious group of Chamber members who want to volunteer their time to be a more active member within the Chamber as well as within the Ruston-Lincoln business community. Being an Ambassador offers you a unique opportunity. Ambassadors work with the Ruston-Lincoln Chamber of Commerce staff and Board of Directors to increase membership, improve member retention, strengthen awareness of Chamber benefits, volunteer their time to assist with various Chamber events, as well as being a part of the decision making of our business community. Ron Veitch is the President of Anti Pest & Veitch and has served in the pest control industry since he was 5 years old when his grandfather, S.D. Veitch, founder of Anti Pest & Veitch would take him along crawling under houses on termite inspections. In his industry Ronnie served as secretary, vice president and president of the Northwest Louisiana Pest Management Association. He was also a State Regional Director serving on the Board of Directors of the Louisiana Pest Management Association. In his community he is in the Lions Club where he was voted Lion of the Year in 1995. He has also served on the Board of Directors and as president of that organization. He has served as a director on the Board of Directors of the Minden South Webster Chamber of Commerce and was recognized for outstanding service as an Ambassador in that organization. He also served on the Board of Directors of Webster Habitat of Humanity and the Fuller Center for Housing. He is a volunteer speaker at YCP the Youth Challenge Program located at Camp Minden housing the National Guard. He is also active in the Christian Motorcyclist Association (CMA). In his church he is an ordained deacon, he has served on the Missions Committee and is active in prison ministries conducted at Bayou Dorcheat and Wade Correctional Center. He is also a member of the Gideons. He loves the outdoors and all things water and woods, fishing, scuba diving, boating, deer hunting and just enjoys being in God’s creation. He has two adult children, Jason & Jennifer, and five grandchildren ranging in ages from 18 months to 13 years old. 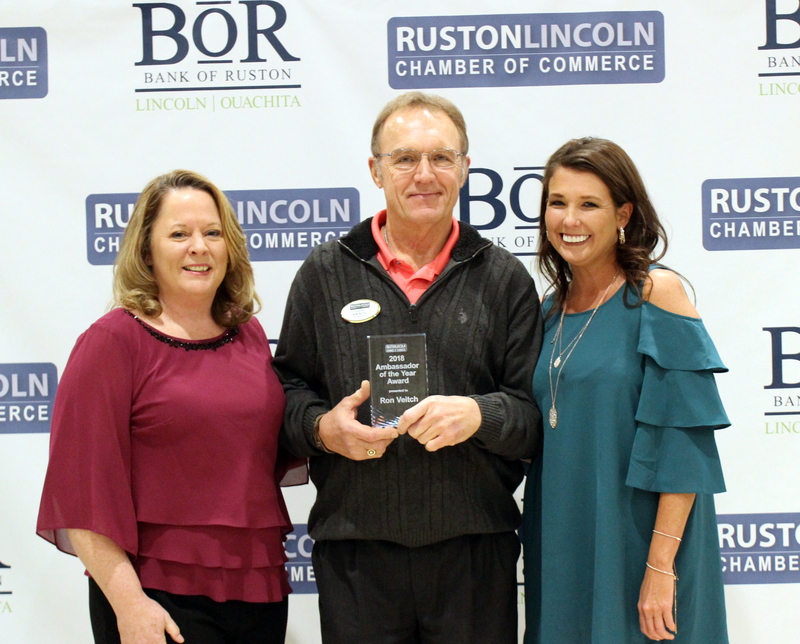 Ron joined the Ruston-Lincoln Chamber of Commerce in 2017 and immediately became active in the community. Serving as an Ambassador gives him the opportunity to be present at new business starts and ground breakings and to meet those responsible for such a thriving economy. Even though he has to drive 30 minutes to be here, he rarely misses a Chamber event. Interested in becoming an Ambassador? Find out about the program in the Ambassador Handbook.